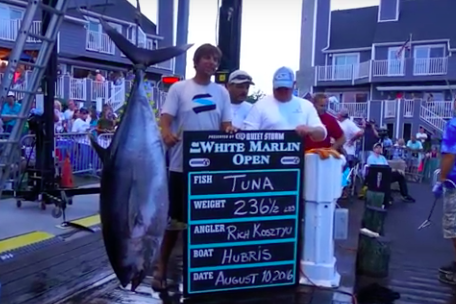 236.5-pound tuna caught at 2016 White Marlin Open. Some failed polygraph tests are at the center of a lawsuit that could divert $2.3 million in prize money to a group of New Jersey fishermen. 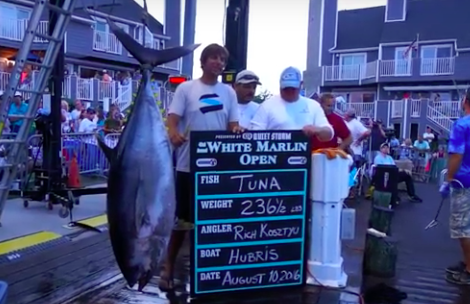 Three weeks ago, a 236.5-pound bigeye tuna was caught during the White Marlin Open in Ocean City, Maryland. The catch set a record in the tournament's tuna category and earned police officer Brian Suschke, firefighter Rich Kosztyu and boat owner Damien Romeo a cool $767,091 for their efforts. Not bad for a group of guys who have been competing in the tournament for years. However, the feel-good story took an unexpected turn this week. According to NJ.com, tournament officials filed a lawsuit in a Maryland court alleging that fishermen on another boat failed polygraph tests, which would force them to forfeit their $2.8-million prize. Under tournament rules, a fisherman must pass a polygraph examination to collect prize money in excess of $50,000. Court documents show that Suschke, Kosztyu and Romeo would be entitled to more than $2.3 million if the disqualification is upheld. The trio did not comment on the report. Tournament officials said that 329 boats competed for a total of $4,450,000 in prizes in this year's contest.